Grinnell will press after they score, or miss, or on a dead ball. On a shot, all attackers rebound except the shooter, who rotates to the top of the key looking for a kick-out pass for a 3-point shot. X1 is the interceptor, X5 is the safety. 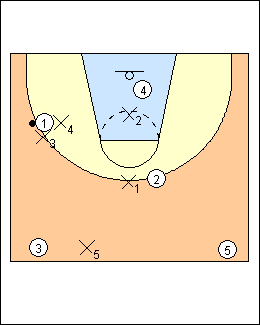 Wings X3 and X2 play inside-out, forcing to the outer third of the court. 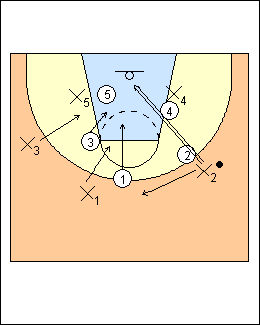 X4 on the ball stops an inbounds pass to the weakside or middle, traps an inbounds pass, take away reversal, step up, one defender covers two attackers on the backside. It's the same if 4 runs the baseline. Shooters are positioned in the press so they can most easily get off 3-point shots in transition. On-ball defender X4 encourages a short-side inbounds pass, left wing X3 softly denies any man in his area so the pass is made on his side of the court, then contains the ball until a second trapper arrives (don't get beat up the sideline). On a weakside inbounds pass, he prevents a return pass to the inbounder. Right wing X2 is positioned to stop a weakside entry and take away a return pass to the inbounder on a ballside entry. At all times the interceptor is positioned between the ball and the basket he is defending, in a position to intercept any weak lob passes to the middle of the court or up the short-side sideline. 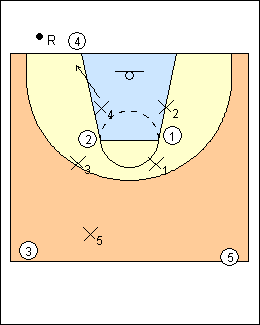 If the inbounds pass is deep and/or up the middle, X4 sprints back to the basket and reads, X2 and X3 sprint to halfcourt and each decides whether to get back into the play defensively or release quickly and trade baskets. Here weakside wing X2 takes away reversal, interceptor X1 steps up to cover 2, safety X5 covers two attackers on the backside. 1997 - the two nearest defenders trap when the ball is inbounded, preferably in the outer third of the court, the other three players leave available only an upcourt and cross-court pass. In the most aggressive pressing scheme, safety X5 will not get back beyond the mid-court line until a third pass is completed; in the most conservative press, he must prevent a layup at all costs. Press positions are the same, except that the shooter can't move up from the top of the key until the trailer (safety) has crossed his path getting back. Here X2 shoots and rotates to the top. They used to have the closest defender to the ball take it, the next two would peel off as the wings, and the last two would peel off as interceptor and safety. Usually the shooter was the safety. 1997 - they set up the zone press after a missed shot, and find the pressure to be most effective when there was no break in the action and the other team did not set up an organized press-breaker. Doug Porter - they look to trap as soon as the opponent secures a rebound. On a 2-point miss, the deepest player back becomes the safety, the two closest players trap the rebounder, the other two players cover the gaps, it turns into a 2-2-1. On a 3-point miss. the shooter rotates out as safety, the two front players are trappers, the two middle players are gappers. They will try for a 5-second count, the ballside wing plays outside in, they close up a little on the backside, and have a little more disguise to the defence. X4 lines up in front of the first-line attackers, seeing the ball, then gets on the ball when it is handed to the inbounder. Doug Porter - their fullcourt dead-ball press is essentially the same as their made-shot press, but be more aware of the touchdown pass, and be prepared for different alignments.